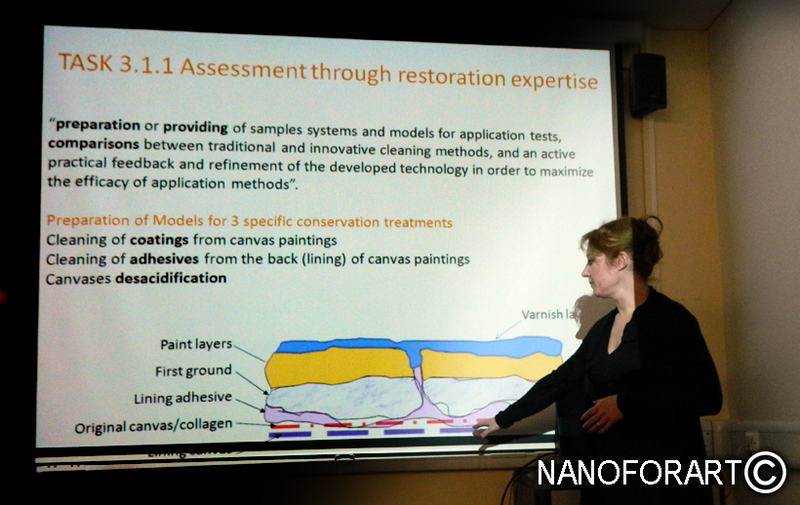 Held in London on December 13-14 2012, the 1st NANOFORART Annual Consortium Meeting has provided a fundamental opportunity for information exchange, transfer of knowledge and expertise between the project partners. Stimulating discussion has been carried out and proposals have been presented involving all the project Work Packages. The wide project productivity, in terms of developed systems for consolidation, pH control and cleaning of works of art, has been fully examined. The National Museum of Anthropology (Museo Nacional de Antropologia, project partner MNAH) at Mexico City holds the second worldwide larger collection of the Teotihuacan archaeological site wall paintings (dating from 1-700 AD). 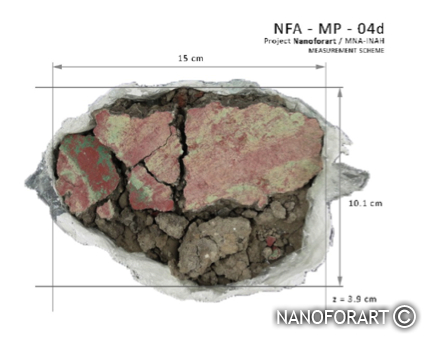 Consolidation tests in the framework of NANOFORART project have been performed on small samples of frescoes recovered in the year 2002 at Xalla, a large Palace Complex located near the Pyramid of the Sun at Teotihuacan (350-550 AD). The aim of these tests was the assessment of new nanomaterials, specifically designed by other project partners for the consolidation of immovable works of art. Detached wall-painting samples from the building Xalla in the archaeological area of Teotihuacan (Mexico). These samples, never treated before, showed powdering of the paint layer as evidenced by using a wet cotton-swab on the surface. Pictures show the application procedure of nanoparticles dispersion by brushing, followed by desalination with cellulose-pulp compress. During the Nanotechitaly 2012 international meeting, held in Venice (21th-23th November 2012), some of the first results obtained in the frame of NANOFORART project about cleaning and consolidation of movable and immovable works of art have been presented to the audience in two conferences and two posters. For further information about the meeting, one should refer to the official website. The workshop will be held at 11 AM on 26th June at the Hotel APLAUS, Šantovo nám. 181, 570 01 Litomyšl, Czech Republic. For further information, please download the flyer of the event. 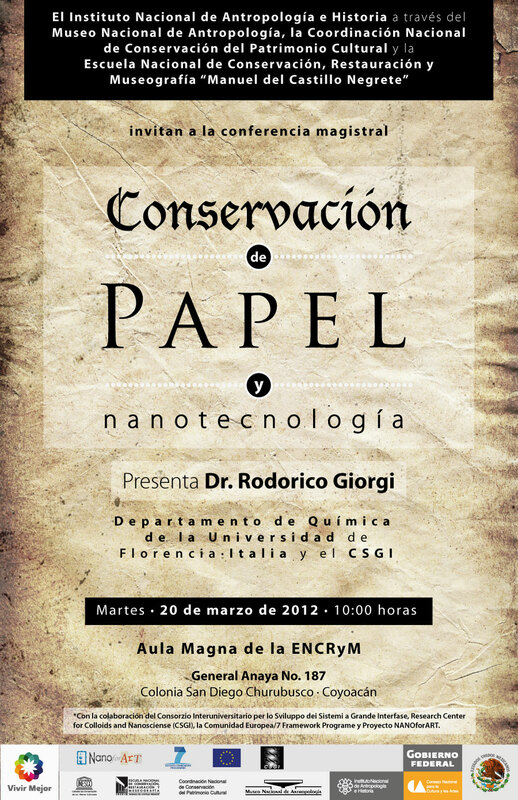 The Instituto Nacional de Antropologia e Historia, in association with the Museo Nacional de Antropologia, la Coordinacion Nacional de Conservacion del Patrimonio Cultural and the Escuela Nacional de Conservacion, Restauracion y Museografia "Manuel del Castillo Negrete" invites to the Conference entitled Conservacion de Papel y Nanotecnologia given by Dr. Rodorico Giorgi (CSGI and University of Florence). The Conference will be held at 10 AM on 20th March in the Aula Magna de la ENCRyM.